Were Hedge Funds Right About McDonald’s Corporation (MCD)? McDonald’s Corporation (NYSE:MCD) was in 48 hedge funds’ portfolios at the end of the fourth quarter of 2018. MCD investors should be aware of an increase in support from the world’s most elite money managers in recent months. 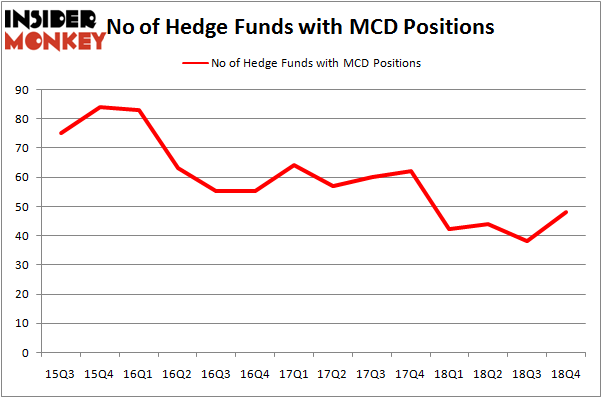 There were 38 hedge funds in our database with MCD holdings at the end of the previous quarter. Our calculations also showed that MCD isn’t among the 30 most popular stocks among hedge funds. In the eyes of most market participants, hedge funds are viewed as unimportant, old financial tools of the past. While there are more than 8000 funds in operation at present, Our researchers choose to focus on the leaders of this group, about 750 funds. These money managers administer the majority of all hedge funds’ total asset base, and by watching their top equity investments, Insider Monkey has unearthed a few investment strategies that have historically exceeded the market. Insider Monkey’s flagship hedge fund strategy defeated the S&P 500 index by nearly 5 percentage points a year since its inception in May 2014 through early November 2018. We were able to generate large returns even by identifying short candidates. Our portfolio of short stocks lost 27.5% since February 2017 (through March 12th) even though the market was up nearly 25% during the same period. We just shared a list of 6 short targets in our latest quarterly update and they are already down an average of 6% in less than a month. We’re going to view the latest hedge fund action encompassing McDonald’s Corporation (NYSE:MCD). What does the smart money think about McDonald’s Corporation (NYSE:MCD)? Heading into the first quarter of 2019, a total of 48 of the hedge funds tracked by Insider Monkey were long this stock, a change of 26% from the second quarter of 2018. Below, you can check out the change in hedge fund sentiment towards MCD over the last 14 quarters. With hedge funds’ positions undergoing their usual ebb and flow, there exists an “upper tier” of noteworthy hedge fund managers who were upping their stakes substantially (or already accumulated large positions). Among these funds, Two Sigma Advisors held the most valuable stake in McDonald’s Corporation (NYSE:MCD), which was worth $251.5 million at the end of the third quarter. On the second spot was Adage Capital Management which amassed $169.3 million worth of shares. Moreover, AQR Capital Management, Citadel Investment Group, and Renaissance Technologies were also bullish on McDonald’s Corporation (NYSE:MCD), allocating a large percentage of their portfolios to this stock. Consequently, specific money managers have jumped into McDonald’s Corporation (NYSE:MCD) headfirst. Renaissance Technologies, managed by Jim Simons, initiated the biggest position in McDonald’s Corporation (NYSE:MCD). Renaissance Technologies had $91.9 million invested in the company at the end of the quarter. Michael Kharitonov and Jon David McAuliffe’s Voleon Capital also initiated a $38.2 million position during the quarter. The other funds with new positions in the stock are Brandon Haley’s Holocene Advisors, Matthew Hulsizer’s PEAK6 Capital Management, and Jay Genzer’s Thames Capital Management. 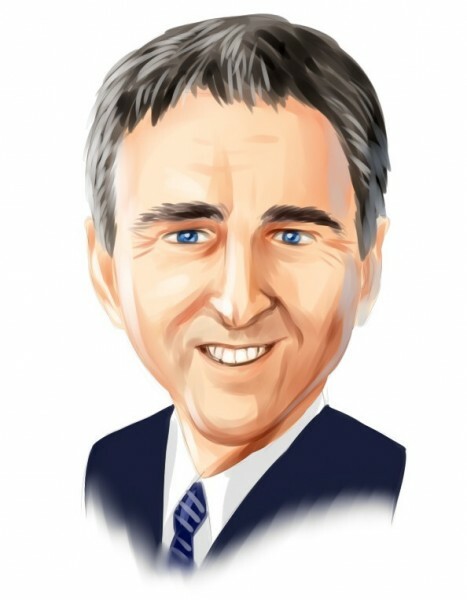 Let’s check out hedge fund activity in other stocks – not necessarily in the same industry as McDonald’s Corporation (NYSE:MCD) but similarly valued. These stocks are TOTAL S.A. (NYSE:TOT), Anheuser-Busch InBev SA/NV (NYSE:BUD), BP plc (NYSE:BP), and Citigroup Inc. (NYSE:C). This group of stocks’ market values match MCD’s market value. As you can see these stocks had an average of 38.5 hedge funds with bullish positions and the average amount invested in these stocks was $3031 million. That figure was $1125 million in MCD’s case. Citigroup Inc. (NYSE:C) is the most popular stock in this table. On the other hand TOTAL S.A. (NYSE:TOT) is the least popular one with only 9 bullish hedge fund positions. McDonald’s Corporation (NYSE:MCD) is not the most popular stock in this group and hedge fund interest has been declining in recent years. This is a bearish signal and we’d rather spend our time researching stocks that hedge funds are piling on. Our calculations showed that top 15 most popular stocks among hedge funds returned 19.7% through March 15th and outperformed the S&P 500 ETF (SPY) by 6.6 percentage points. Unfortunately MCD wasn’t in this group. Hedge funds that bet on MCD were disappointed as the stock returned 5.0% and underperformed the market. If you are interested in investing in large cap stocks, you should check out the top 15 hedge fund stocks as 13 of these outperformed the market. Were Hedge Funds Right About The Coca-Cola Company (KO)? Should You Buy The Boeing Company (BA)? Do Hedge Funds Love Taiwan Semiconductor Mfg. Co. Ltd. (TSM)? Here is What Hedge Funds Think About Cisco Systems, Inc. (CSCO) Were Hedge Funds Right About Merck & Co., Inc. (MRK)? Were Hedge Funds Right About Novartis AG (NVS)?